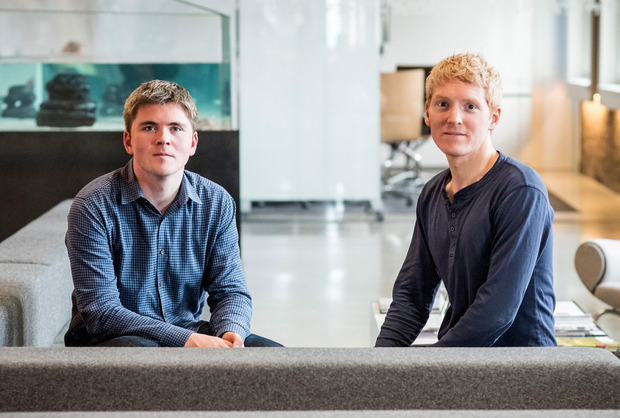 Around 100 Davy clients who are long-term investors in the US venture fund Tiger Global have already seen a paper return on a stake in payments firm Stripe, which was founded by Limerick brothers Patrick and John Collison, in just a few months. Irish investors had access to a fundraising in Stripe last October via Davy Private Equity Strategies II (DPES II Fund)/Tiger Global fund. At the time of that fundraising, Stripe was valued at $20bn. A new fundraising last month put a value of $22.5bn (€19.6bn) on the business. That equates to a 12.5pc increase in one quarter. The company raised an extra $100m (€87.5m) in follow-on finance from Tiger Global following the $245m it announced last year from the same venture fund. The move comes as Stripe builds out its products and services, expanding into areas such as fraud prevention and physical payment devices for shops, such as its new Stripe Terminal. Stripe was founded in 2010 by the Collison brothers. Its headquarters is in San Francisco with hubs in Dublin and Singapore and a number of other international offices.